Provides female athletes that have the desire to compete the coaching and camaraderie that will help them achieve both competitive and non-competitive cycling goals in a safe and enjoyable manner. Develops in them an awareness of what it is to be an athlete that is both gracious, and respectful to their community. 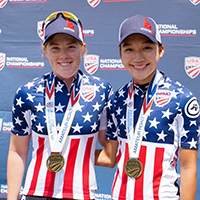 Guides athletes towards learning new skills and disciplines, and spreads the foundations of bike racing in the USA, especially among women. Supports the equal treatment of women, in not only the cycling community, but in all women's sport. Is my contribution tax deductible? Your contribution to Tam Cycling Inc and TWENTY20 Women's Professional Cycling Team will be tax deductible. Tam Cycling has received an exemption determination letter Therefore is exempt under section 501(c)(3) of the Internal Revenue Code, contributions to Tam Cycling are tax deductible.